Welcome fellow Missouri writer (my fellow Missouri writer anyway!) Janet Cannon and her winning story in the 2013 Summer Flash Fiction Contest: "Planning, Peppers, and Push-up Bras or Daddy's Three Essential Rules for Success." If you haven't read this humorous piece with an amazing title, yet, you can do so here. 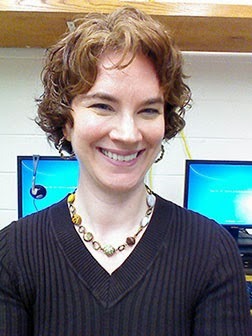 Although her undergraduate and master’s degrees are in English, Janet Cannon somehow successfully teaches math and computer skills to both children and adults. She is proud of the fact that repeating, “Do you want fries with that?” has never been a job requirement. She edits her school’s newsletter and the Missouri State Writers’ Guild newsletter, runs 5ks and half-marathons, sews rag-rugs, composes world drumming pieces, and tries to learn new skills as often as possible while still finding time to spend with family and her awesomely supportive husband Mike. Her publishing credits include a technical manual, many short stories (one just published in Spirits of St. Louis: Missouri Ghost Stories, available on Amazon.com), inspirational essays, and quite a few pieces of Twitter fiction. She is currently working on a YA urban fantasy novel about a young woman who is afraid of everyone when, in truth, everyone should be afraid of her! You can find Janet’s metaphorical/satirical commentary on life as a writer at http://revisionisadishbestservedcold.blogspot.com and can contact her at http://www.facebook.com/janet.cannon.10 or janetcannonwriter (at) gmail.com . WOW: Congratulations, Janet, on your contest win for "Planning, Peppers and Push-Up Bras"! Where did you come up with the idea for this story? Janet: A friend of mine is a single dad. He's great with his daughter, but she can be a handful at times. He posted on Facebook one day that he hoped his daughter appreciated that children didn't come with a return policy and that got my mind to spinning. What would be a worst-case scenario but still funny? I let him read the story, and he thought it was hysterical. WOW: Inspired by real life! Do you have any tips for writing flash fiction? What's your process like? Janet: I usually start with the punchline or ending and work backward, as I did with this one. Then I try to come up with at least two or three twists that surprise the reader. The hardest part is analyzing each word to make sure I need it. You can cram a lot of content into a story by stripping out the fluff and only leaving what is truly meaningful to the reader. WOW: So true! Why do you enter contests? What are the benefits? Janet: I'm a competetor, but probably not for the same reasons others are. I compete against myself: not for a prize or an award--although those are always nice--but because I need to challenge myself to improve. I've learned from the discipline of running that there are many talented people out there that can run (write) just as well as I can, and many of them better. However, if I push myself to compete, to expose myself to criticism, to risk losing, I gain experience some of those people miss out on because they are too fearful of disappointment. Failure is the best teacher. Ask any highly successful author. WOW: You are so busy! How do you find time to write? Janet: My job as a teacher is a huge part of my life. I won't lie: finding time and motivation to write is a daily struggle. However, I've realized that I have to make time, not find time, if I want to be successful. Good writing is like an iceberg. What you see published is tiny compared to all the bad writing, pre-writing, planning, first/second/third/etc. drafts that came before it. When you realize the amount of work that has to go into getting that tiny bit of good writing published, it can be overwhelming. It's also satisfying when you think back at all the hard work you've put into a story, and people say it touched them or made them laugh. WOW: Yes, you spelling it out like that really makes it seem completely daunting! Do your activities or experiences while teaching ever make it into your writing work? Janet: Definitely! I work with many students that come from less than perfect homes, that have learning disabilities, that suffer from bullying; and let's face it, they ALL suffer from pre-teen hormone drama in fifth and sixth grade. I never single any of them out when writing, but my current novel pulls elements of these issues and tries to tackle how my main character begins to deal with her problems. We write what we know, right? WOW: Right! You also belong to writing groups. Why is this important to you? Janet: It is impossible to edit your own work. You know what you mean to say; but when it's put on the page, sometimes you don't adequately convey what you mean. I think it is essential to have a small group of trusted writing friends to circulate your work to help you clean up the rough spots and give you perspective. It's not a sign of weakness. It's a realization that real writers understand the power of the beta reader/editor. WOW: Anything else you'd like to add about writing or contests or even your novel-in-progress? Janet: Writing contests can be a great motivator to continue writing new pieces. Even if you don't win anything, it keeps your skills honed for following directions and writing to prompts. If you do win, those are credits you can put in your query letters when trying to pitch your novel to an agent or publisher. As for my novel-in-progress, I'm so excited to finally be getting this baby completed. It's a YA urban fantasy novel about a young woman who is afraid of everything...but shouldn't be. She's built her life in the shadows, avoiding people and living on the fringes of society until one day, to help another little girl, she has to step out of the darkness and into the light. My beta readers are almost finished; and as soon as I make revisions based on their recommendations, I'm sending it to a professional editor. I plan to pitch it at the Missouri Writers' Guild Conference in April. This "iceberg" has been several years in the making, and I can't wait to share it with the world. WOW: How exciting! And I can't wait to read it. Thanks, Janet! Congratulations, Janet! Best of luck with your work. Knowing you, Jan, the YA novel is going to be awesome! Can't wait to read it.